U.S. Gymboree gives you the chance to save money during these days! Do not miss out this amazing opportunity! 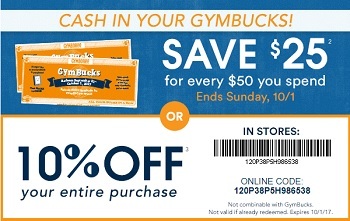 GymBucks: save $25 for every $50 you spend. Or, take 10% off your entire in-store purchase with printable coupon. For more information about the offer visit any U.S. Gymboree store or U.S Gymboree online.